Agenda Wednesday, October 21, 2015 7:30 p.m.– 8:30 p.m. (optional) Vieux Carré Vinyasa. Instructors: Jennifer Hauge, Yoga at Work by Jennifer Location: Pool Cabanas An Institute first. If the present state of class action law has you not so present, just breathe and join us for evening yoga, taught by the Institute’s resident yogi, Jennifer Hauge. It’s the perfect way to bliss out before hitting Bourbon Street, then joining our krewe for two days of class action action. (Important, we can’t provide yoga mats so please remember to bring your own). Thursday, October 22, 2015 “Where Y’at?” It’s Time for Day 1. 8:00 a.m.– 9:00 a.m. (optional) 11:30 a.m.– 12:45 p.m. (optional) 12:45 p.m.– 1:30 p.m. (optional) Yoga Lagniappe! Instructors: Jennifer Hauge Location: Pool Cabanas If you’re up for a little something extra, something to sweeten the deal—like an extra beignet from Café Du Monde or some bonus Oysters en Brochette at Galatoire’s— then join us for a.m. yoga . Jennifer will put us in the right state of mind for the two days that lie ahead. “Who Dat? !” It’s the Return of Class Actions 101 . . . 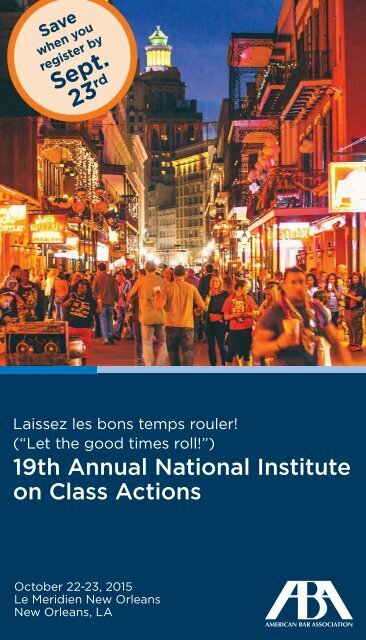 Speakers: Andrew J. McGuinness, Daniel R. Karon Line the streets for this year’s version of our instant classic-Class Actions 101. This class action primer will showcase Federal Rule 23 and will describe as many class action trends as we can handle. In doing so, we’ll bring Rule 23 to life by applying it to reallife situations, examining whether class certification is appropriate. So if you’re a new lawyer or simply a lawyer new to class actions, join us for a kickoff program that even the Saints can’t rival. . . . and the Introduction of Class Actions 201. Speakers: Donald R. Frederico, Deepak Gupta Wait. There’s more? For the first time, we’ll follow Class Actions 101 with an advanced course—Class Actions 201. We’ll take the concepts from Class Actions 101 and learn how to prepare a class certification packet, meaning a class certification brief, proposed trial plan, proposed class certification order, and opposition brief. We’ll even throw in Rule 23(f) petitions and appellate briefing. Between these two programs, you’ll be the creole deal, sure to impress your firm and its clients. 1:50 p.m.– 2:00 p.m. Welcome to The Big Easy! 2:00 p.m.– 3:00 p.m “Bayou Review.” The Past Year in Class Action Jurisprudence. Speakers: Professor John C. Coffee, Jr., Professor Alexandra D. Lahav Like the Krewe of Endymion barreling down Canal Street, the past year offered a boatload of class action excitement. So back by popular demand, Professors Coffee and Lahav will get us underway by announcing this year’s important class action developments—developments that everyone must heed if they want to advise their class action clients properly and stay suitably perched atop their class action floats. Agenda subject to change without notice. Agenda 3:00 p.m.– 4:00 p.m. You Have a Choice, Picayune—“Consumer Rip-offs” or “No-Injury Class Actions.” Either Way, Does a Legal Claim Exist? Speakers: Honorable Nannette Jolivette Brown, Professor Alexandra D. Lahav, Jonathan D. Selbin, Andrew J. Trask Moderator: Daniel R. Karon What happens when a product is defective, but its defect hasn’t manifested . . . yet? Or what if a product is defective, but it hasn’t caused physical injury or property damage . . . yet? If a product hasn’t demonstrated its defect, is this product even defective? Because what if manifestation never occurs? After all, who’s to say that every unit will demonstrate a problem, whether affecting itself, people, or other property? For this reason, can a class action claim even exist before a defect presents? Need we wait until a product that seems inclined to fail actually does fail before injury-in-fact is considered to have occurred? Need we wait until someone is killed or maimed or someone’s property is destroyed before our courts will support a claim? Is that sensible or just asking for trouble? We’ll attack this jambalaya of jurisprudence, debating whether Article III standing exists in these cases or is merely voodoo. 4:00 p.m.– 4:15 p.m. 4:15 p.m.– 5:15 p.m. Break King Cake or Po-Boy? Do Class Actions Offer Meaningful Compensation to Class Members, or do They Simply Rip Off Consumers Twice? Speakers: Warren T. Burns, Honorable John W. Lungstrum, Professor Brian T. Fitzpatrick, Robert J. Herrington Moderator: Vincent J. Esades Beaucoup Crasseux!—Consumer Class Actions are under Attack! Well, that should certainly come as no surprise. Of course, the principal charge against consumer class actions is that they offer little compensation to class members yet provide Fat City to plaintiffs’ lawyers. But should consumer class actions be measured by their compensatory value or should they be judged by their deterrence value? And if we consider class actions’ compensatory role, how do we define or gauge compensatory success? Do we focus on whether class recoveries deliver compensation commensurate to a significant portion of the class, or do we measure compensatory success by some other metric? If, as Judge Posner observed, “only a lunatic or a fanatic sues for $30,” what do we call someone who sues for a million lunatics or fanatics?  And while numerous empirical studies include data on the “face value” of class action settlements, scholars have found very little data on how much of this face value actually makes its way to class members. Despite unyielding efforts to inexorably hex consumer class actions, we will face this challenge and discuss what can be done to improve class actions for consumers and defendants. 5:15 p.m. Adjourn 5:30 p.m.– 7:30 p.m. Mardi Gras at Le Meridien! After having imbibed some good class action content, rechannel your attention and join us for a cocktail party at Le Meridien’s stylish Gallery. In a casual atmosphere, you can network, meet other Institute guests, and get to know our faculty. This relaxed event in the heart of New Orleans promises to be a beaucoup ball! Agenda subject to change without notice.